I was kind of mad at God last night. I felt that a really bad joke had been played upon me, and the freakish coincidence in which it happened blew my mind. I couldn’t imagine at the time why He would allow such a thing to happen. On a beautifully warm, sunny day I made my way to a popular place in Pennsylvania where quaint little shops and fun eateries line sidewalks along the river. I was meeting up with my daughter, who was visiting from Florida, and her friends. It was a 1 ½ hour picturesque drive to get to where I was going – to the state in which I used to live. We had a nice lunch and happy conversation, and then ventured onto the sidewalks for some browsing time. At one point I was left alone on the sidewalk with her friend and baby as the others went to put some things in the car. The sidewalks were jam-packed with tourists. I was enjoying people-watching. And then, suddenly through the bustling crowd emerged a familiar face – the ex-husband with the woman he left me for. It was the first time in over 3 yrs that I’d seen him – since the day I found out and told him to leave. I stared at them for a moment, and then looked away. My heart pounded in my chest. I didn’t know what to do or say. Then my zodiac sign of Cancer personality did what I knew best to do – retreat. I ignored him and pretended I didn’t see him. I’m not sure that he saw me, even though he glanced back. Maybe he was playing that same game of denial we both knew so well. I felt the scab of healing rip off, and I couldn’t stop the bleeding. When my daughter found out, she was livid. I’m sure she was scouring the streets for his face and practicing what she would say, as I was. I regurgitated my feelings of anger. They asked if I wanted to leave, but I would not let him ruin my day. They hugged me and looked at me with sadness – maybe pity. I remarked that if I didn’t have bad luck I would have no luck at all. But that, in fact, is not the case because my life since then has had more blessings than I can count. One immediate blessing was that we never saw him again. My chest was tight with anxiety and pain that night. I called my aunt who knows me well and also talked with my older daughter as we rehashed what happened and searched for a meaning. It was good just to talk, unload and get reassurance, but there was no answer to my question of why. Later that night I picked up a book I had recently purchased called “Ten Prayers You Can’t Live Without” by Rick Hamlin. I turned to the chapter on forgiveness. It was there that I found my answer. It said that working on an old grievance can be a guilty pleasure, self-justification, a repeating refrain in our heads. Our hurts can so define us that letting them go is like erasing our personalities, a frightening prospect. It went on to say that forgiveness is like the bell in a church tower. You pull on a rope and let go but the bell keeps ringing and ringing, slower and slower until it finally stops. 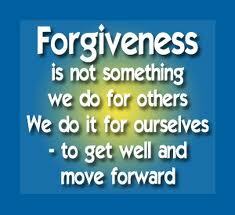 When we forgive someone, we take our hands off the rope. But if we’ve been tugging at our grievances for a long time, we mustn’t be surprised if the old angry thoughts keep coming for a while. I’ve wondered why I can’t get past this. I seem to be standing still in my life and enjoying the pity party I’ve been throwing for myself. Now I finally realize what I have to do. I need to forgive him in my heart. After all, I take responsibility for part of what went wrong, but now I have to let go of the rope of hatred and bitterness so I can live my own life once more. My neighbor Eva said a verse in Italian to me the other day that her father used to say to her. It means “Bad things happen for good reasons.” Yes, the process I went through to end that marriage was hard and bad, as was seeing him yesterday, but I feel like I can put it behind me now for all the good reasons to come. There are no coincidences. God knew exactly what He was doing when he let me see him yesterday with her. It wasn’t some twisted practical joke after all. I woke up feeling better today about everything. Like a heavy weight was lifted from my chest. Today I’m washing my hands, taking a deep breath and moving toward the light. Another plan well done, God!